In 2006 the Virginia Historical Society acquired an oil painting, measuring 40 x 65 inches, capturing a scene from the April 1, 1865, battle of Five Forks. charging Union cavalry, led by a flag-waving Gen. Philip H. Sheridan, are shown slamming into a wall of Confederate defenders near the important crossroads west of Petersburg. The scene represents a dramatic moment in the pivotal battle of the last major campaign of the war in Virginia. The battle of Five Forks ushered in the final moments of the nearly ten-month-long siege of Petersburg. Since June 1864 the Confederate Army of Northern Virginia had extended its entrenched positions to the south and west of that rail center to protect the army's supply routes. By April 1865 the only major one open to Robert E. Lee's army was the Southside Railroad, which entered the city from the west. Ulysses S. Grant saw an opportunity to cut that rail line and compel Lee to abandon his Petersburg defenses. To accomplish this, Grant ordered his aggressive subordinate, Philip Sheridan, to take a combined force of infantry and cavalry and attack the thinly held right end of the Confederate line, located on the White Oak Road. Beginning at 4 p.m. and lasting for three hours, roughly 17,000 Federal troops under generals Sheridan and Gouverneur Warren collided with 10,000 Confederates commanded by generals George E. Pickett and W. H. F. "Rooney" Lee. The fighting ended after the Union troops successfully overwhelmed both flanks of the southern line, which was centered on the crossroads that gave the battle its name. Sheridan's losses numbered around 800 men, while Pickett lost 3,000, most of whom were captured in the fight. Lee's last major supply route had been broken. The next day, after suffering an all-out assault against the remaining Confederate positions around Petersburg, his army began a march that would end at the small village of Appomattox Court House. 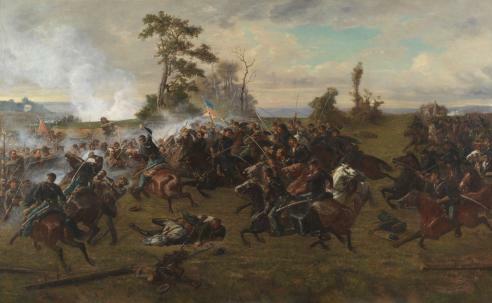 In 1879 the French artist Paul Dominique Philippoteaux (1846–1923) came to the United States to paint a memorial cyclorama of the battle of Gettysburg. That 360-degree circular oil painting depicting Pickett's Charge went on display in Chicago in 1883. Another version of the cyclorama ended up at Gettysburg, where it remains today. Other Philippoteaux Civil War paintings are on display at the Pollard Memorial Library in Lowell, Mass. Around 1885, he turned his talent for capturing military combat on canvas to the battle of Five Forks. It is that painting that the VHS acquired. The Battle of Five Forks was given in memory of Peter Charles Bance, Jr., by his mother and father. Search for books, manuscripts, sheet music, maps, and broadsides in the our Online Catalog.